Although its aim was to bring good design to the masses, Mid-century furniture has become extremely collectable today, fetching high prices for pristine examples. If you’re lucky enough to come across a tired original at a bargain price, with covering beyond repair, why not revive it for 21st century living? Not sure where to start when sourcing vintage pieces? Check out our guide to sourcing Mid-century furniture. Soften the striking, biomorphic forms with the textured weaves of natural linen for a relaxed feel suited to a period or contemporary home. Original Mid-century sofa in Plain Linen fabric in Saffron, and chairs in Plain Linen fabric in Turquoise, both £46 per m, all Vanessa Arbuthnott. From the 1950s onwards, limited paint palettes began to be replaced by new charts featuring a spectrum of intermediate tones, and bright colours were often used to enliven streamlined, rectilinear architecture. Taken from its Mid-century paint range, Fired Earth’s South Bank teal/turquoise shade is a signature colour of the period, alongside buttercup yellow and flaming orange. Pictured here, it creates the perfect foil to the rich chestnut grains of an iconic teak sideboard. From £55 for 2.5ltrs of eggshell. 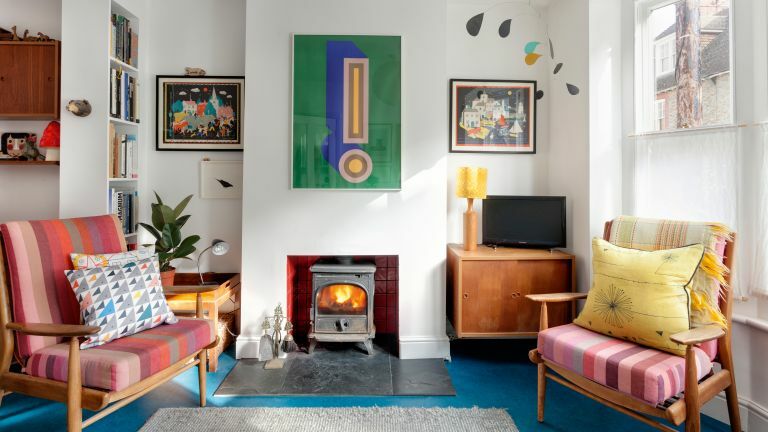 Just because you don’t have a Mid-century property, it doesn’t mean you can’t embrace retro style, as this renovated farmworker’s cottage proves. With an emphasis on simple lines and purity of design, combined with the enduring beauty of wood, Mid-century timber furniture, such as these original Ercol sofas, have a timeless appeal, which sit well with other styles both old and new. Mid-century designers put practicality and functionality at the forefront of their furniture designs, often developing new and exciting modular, adjustable and multifunctional systems for flexible living. A notable example is the Danish PS shelving system which incorporated adjustable shelving, sliding cabinets and drawer units in in one. Here this original is available from places such as Panamo and Ebay, and is useful for storage and keeping books, but also incorporates a desk area. A hallmark of Mid-century style, the chair was continually reimagined by designers seeking to marry form and function. As much a piece of sculpture as seating, an iconic piece will enliven an empty corner. Opt for plain walls in a retro shade to make the silhouettes of iconic pieces really pop. Upholstered chairs were often stripped of excess padding to reveal their frames, just as the art world was stripping forms back into abstract shapes. Complement original furniture with retro-inspired homeware, such as Orla Kiely's Giant Abacus cushion, £40. Scandinavian furniture designers of the 1950s and '60s are renowned for their high quality, stylish and stripped back wooden furniture. This living room is furnished with original Danish Scandart chairs for an authentic Mid-century feel and are accessorised with cushions from Playroom Interiors. With their streamlined, paired-back designs, this Ercol bench and these old ply stacking school chairs help keep this farmhouse feeling light and spacious. Designed in the 1940s this Originals love seat in a Straw finish, made from beech and elm, is £800 at Ercol. Combine bright primary colours with ply furniture and a vibrant Formica desk, typical of the 1950s and 1960s, to create an inspiring home office. Often reserved for special occasions, the dining room is a great space for adding statement wallpaper. This radical, stylised Starflower print, dating to 1967, has a kaleidoscopic quality undoubtedly influenced by the Op Art movement popular of the time. Now reprinted in several colourways by Little Greene, including near to the original (as pictured), it will set the tone for a retro scheme; £74 per roll. Despite the development of innovative new materials such as plastic, fibreglass and laminates, timber sustained popularity throughout the mid-20th century, with furniture designers favouring durable hardwoods such as teak, cherry, maple and beech. These streamlined timber pieces with tapered legs continue to inspire today, with retro designs readily available for those who want nostalgic but new. Bed in Acorn, £799; grand bedside table, £399; three-drawer chest, £699; tufted dining bench, £299, all from the Mid-century range at West Elm. Covered in a collage of 1950s adverts, this Retro Ads Sepia wallpaper from Mind the Gap will bring a playful and quirky touch to a living room, £150 per roll at Lime Lace. For a quick and easy retro pop try updating a lamp with a shade in a retro print or styling a plain sofa with cushions made from 1950s fabrics. Winter's Moon have a great selection of lampshades and cushions made up in vintage fabrics and barkcloths as well as retro-inspired designs such as Brie Harrison's beautiful Carnation print. Generally believed to span from mid-1940 to 1970, Mid-century modern was a design movement across America and Europe that influenced everything from architecture to textiles. Born from a spirit of post-war optimism, the movement evolved organically against a backdrop of cultural change as designers sought to deconstruct conventions and reinvent architecture, interiors and furniture for changing lifestyles and a consumer age. Emphasis was put on ergonomics and efficiency; living spaces became open plan and homes were fitted with the latest appliances, while furnishings were considered an integral part of architectural schemes and were designed to enhance the space. Furniture, ceramics and soft furnishings were highly influenced by the art and sculpture of the time, as well as a fascination with space-age futurism, and are characterised by streamlined, biomorphic shapes, contrasting colours and abstract prints. Combining innovation with simplicity, utility, comfort and quality, the movement has gained a cult following and continues to influence designers today. Looking for more decorating ideas?